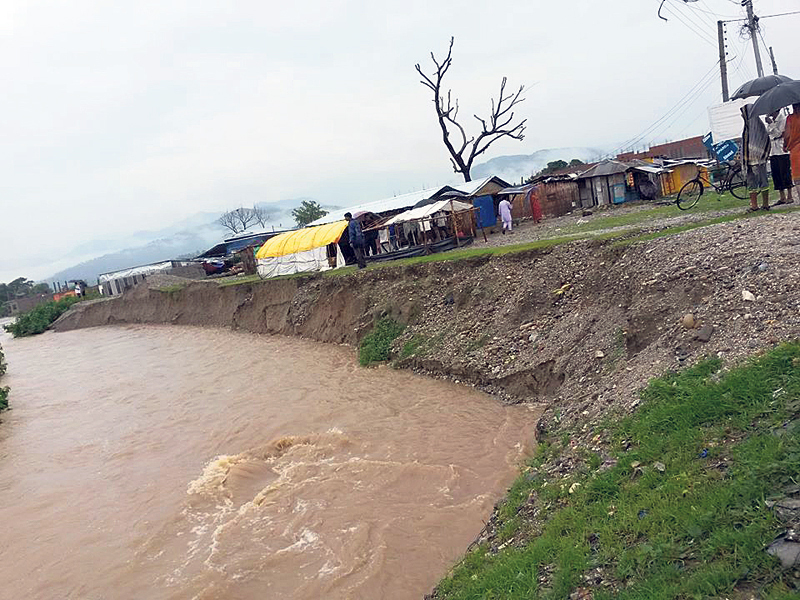 UDAYAPUR, Aug 6: The Koshi River, which flows between the border of Udayapur and Sunsari districts, has been changing its course on a daily basis. This has put thousands of families in various VDCs of Udayapur district at high risk of being displaced. Of late, the river has been setting its course in western direction against its natural course. The swollen river has begun eroding the land along its embankment. This has prompted locals to fear that their settlements might be at high risks of inundation or being completely swept away by the river. 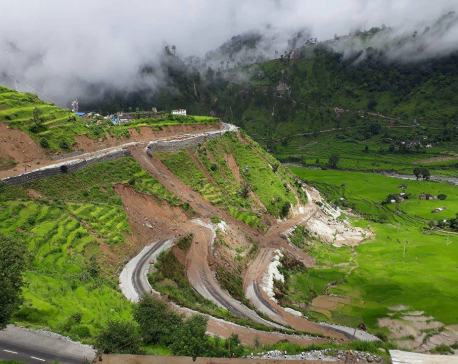 Settlements of Tapeshwar and Rampur Thokshila VDCs are particularly at high risk. According to the locals, daily floods in Koshi River since the start of monsoon has put their settlements at high risks. Sisauli village of Rampur Thokshila-2 and Bhagalpur Bandada of Tapeshwar VDC are at constant risks of being washed away by floods and land erosions. “Additionally, change in the course of Koshi River has also endangered ward 3, 4, and 5 of Rampur Thokshila,” said Tirtha Parajuli, a local. According to him, monsoon-triggered floods in Koshi have been eroding about 215 meters of land every day. And locals fear that the river would continue eroding lands in the days ahead if the incessant rainfalls continue. The locals have requested the District Disaster Relief Committee (DDRC) and District Development Committee (DDC) for immediate assistance to prevent the river from eroding lands. However, VDC officials informed that their call for help remains unattended so far. “Settlements of Tapeshwari VDC are at high risk in compared to previous years. Particularly, settlements of Bandadanda, Bhagalpur and upper villages of Tapeshwari-1 are under imminent danger,” said Diliram Bimali, former VDC chairman of Tapeshwari. As the dangers continue to grow, locals of Udaypur and Sunsari districts have asked help from their respective DAOs and security bodies. “Locals had requested for assessing situation in affected areas. We have recently taken finished it,” said Chief District Officer Krishna Chandra Ghimire of Udayapur. Local District Officer (LDO) Pitambar Adhikari, Suman Khadka, chief of Nepal Army's Bhawani battalion, Superintendent of Police Nar Bahadur KC, Madav Paudel of Armed Police Force based in Triyuga, among other officials in the district, were part of the assessment team. “During the field visit, we found that settlements of Thokshila ward 3, 4, 5 and two settlements of Tapshwari-1 are of high risks of erosions by Koshi River,” said CDO Ghimire. “Even settlements of Prakashpur and Mahendra of Udaypur are at high risks of erosion. Keeping the dangers in mind, both the districts have recommended DDRC and Department of Water Induced Disaster Prevention to take necessary initiatives at the earliest to prevent further erosions,” he added. According to LDO Adhikari, it is very important to teach locals some methods to prevent immediate casualties by erosions. “To prevent the erosion, at least two sacks of cements and 30 sets of embankment fences are needed. As small budgets won't be sufficient, we have taken informed concerned authorities for availing immediate aid,” he said, further adding that the DDRC has formed a team to prepare short-term and long-term plan for stopping erosions along the embankment. Nepal Army (NA), Armed Police Force (APF), DDC, and DDRC have assured locals that they would take individual and collective measures to prevent disasters. 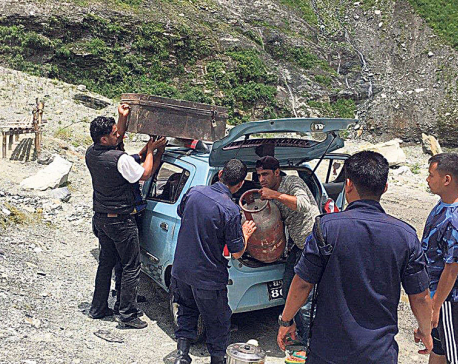 Bhawani battalion of NA, APF, and Nepal Police have assured of they would mobilize their resources and have already prepared separate relief teams for responding to emergency calls. According to locals, Koshi River has been deviating from its original course and been flowing westwards while continuously eroding lands. At present, erosions by the river has put Mahendranagar and Prakahspur of Sunsari district at high risks. 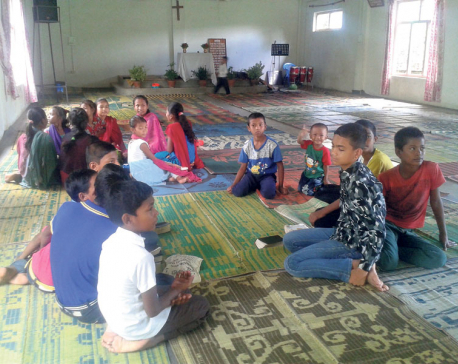 “Many have already left their settlements due to fear of land erosions during monsoon. People leave the settlements during monsoon and return home when monsoon is over,” said Raman Bhattarai of Rampur Thokshila. Locals have been complaining of lack of presence of security bodies in the areas. Additionally, they accused that the government and the local administration have neglected them due to difficult topography of the place. However, CDO Ghirmire denied the claims. He said authorities were working out measures to address the crisis and are presently holding discussions with the local political parties and other stakeholders to formulate long terms plans for addressing such crisis in the future as well.